Alcohol withdrawal is a sudden discontinuation of alcohol consumption by a person who has been an excessive drinker for a long period of time. Persons who consume too much alcohol become more dependent to tolerate the alcohol in their body, so their brain and body cannot accept the sudden removal of the particular chemical from their system. This causes alcohol withdrawal syndrome (AWS), the effects of which range from intense to life-threatening events. Alcohol causes both physical and mental problems depending on how great the impact of the withdrawal effect is on the central nervous system (CNS). Specialists for treating alcohol withdrawal may prescribe certain medications to reduce withdrawal pain. After the symptoms of alcohol withdrawal have been reduced, the person can focus better on complete discontinuation from alcohol addiction. The sudden withdrawal of alcohol is not healthy, because during alcohol intake, there is inhibition of neurotransmitter activity on the CNS. The body system gradually adapts to the consumption of alcohol, so when alcohol consumption is stopped, there is a reversal of this activity. The brain starts to increase the activity of excitatory neurotransmitters and this results in hyperexcitability, which then leads to withdrawal syndrome. Dopamine, a neurotransmitter responsible for voluntary movement, is found in elevated levels while consuming alcohol. It gives a pleasant feeling, excited mood, and self-motivation. Once the alcohol leaves the bloodstream, the characteristics of dopamine get reduced and AWS is induced. Alcohol withdrawal is influenced by factors including medical history, family background, stress levels, duration and amount of alcohol consumption, and presence of mental disorder. The usage of other drugs along with alcohol increases the dangerous side effects. 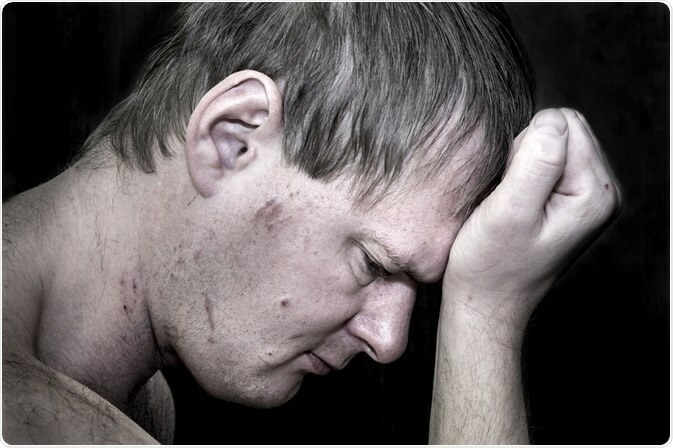 An alcohol-dependent person faces terrible withdrawal symptoms. Mild to moderate symptoms occur after 2 hours of the last alcohol consumption. These symptoms are at a peak for 24–48 hours, lasting for about 1 to 5 days of alcohol withdrawal. Both physical and psychological symptoms are observed. The physical symptoms are trembling (hand), feeling sick, irregular heart rate, headaches, fever, hypertension and abnormal respiration, sweating, loss of appetite, heart palpitations, nausea, abdominal pain, trouble in sleeping, and vomiting. The psychological symptoms are feeling anxious, depression, mood swings, foggy thinking, mental confusion, and irritability. Severe symptoms of alcohol withdrawal are seizures and delirium tremens (DTs). Seizure occurs in 2%–9% of people who depend on alcohol, within 2–3 days of the last use. DTs are the most serious symptoms of alcohol withdrawal, it happens in about 3%–5% of people who stop drinking. If this symptom is left untreated, it leads to fatality. A few other symptoms are vivid hallucination (feeling or seeing things that are actually not present), confusion and disorientation, fever, agitation, hyperactivity, insomnia, increased heart rate, blood pressure, pulse rate, breathing rate, and abnormal liver function. Alcohol detoxification or detox is a short medical course that blocks the withdrawal symptoms when alcohol intake is stopped. To achieve a stable point in detoxification, monitoring blood pressure, body temperature, heart rate, and control of the physical symptoms is important. Medical detox helps to treat physical symptoms of alcohol withdrawal such as insomnia, dehydration, seizures, and nausea. Chlordiazepoxide is a sedative medicine that is used to reduce the hyperactive factors of CNS and helps to attain its original form. Under medical supervision, after a certain period of time, the alcohol usage is gradually reduced and weaned out of the body without any side effects. Supplements, a healthy diet, and pleasant regular sleep can make better improvement and fast recovery. Psychological health can be improved by three FDA (Food and Drug Administration) approved drugs: disulfiram, naltrexone, and acamprosate. These medications help to treat depression, anxiety, and suicidal ideation. It also controls the individual’s thoughts of consuming alcohol. An individual with moderate and severe withdrawal symptoms should be hospitalized, because monitoring of symptoms like hallucinations and delirium tremens is required. For mild to moderate AWS, patients need not be hospitalized as a caregiver to monitor them at home is sufficient; however, a daily visit to the medical center is essential till full recovery. Living in a drug-free environment also helps to stay sober. Self-discipline and self-control throughout life is the best treatment for alcohol withdrawal.